Sheoldred hadn’t slept for three days. She stood on the balcony of her aerie and wrung her hands, finally clasping them in front of her—a childhood gesture that had survived all the compleation and that she had been unable to unlearn no matter how ridiculous she knew it looked. An array of nim and idiots were in the stone courtyard below her, milling around like insects. They shuffled uncertainly beneath her black gaze. For all they knew she was furious and about to slaughter every single one of them. How could they know all she could think about was her missing homunculus bread-courier? The delivery time had come and gone with no soft knock on her chamber wall. She had waited up, thinking it was just an operational fluke, but when the caged sun rose and still no bread had arrived, Sheoldred knew something was horribly, irrevocably wrong. Was it a food shortage? A labor dispute? Had the humans fled the Furnace Level? Had Jin-Gitaxias discovered her weakness and slaughtered all the bakers? Was the resistance holding out on her, planning to use this as a bargaining chit? Had they simply forgotten? Sheoldred spun a ring on her left hand. Another remnant; another tell. Thank goodness her enemies weren’t here watching her. Her tics were less and less controllable these days, but Sheoldred had told no one of the degeneration. Showing weakness around this filth was the fastest way to end up in a vat somewhere with your insides ripped out. Touching the ring calmed the Whispering One. She willed her hands to stop trembling, and then she commanded the clammy sweat dripping down her neck to dry itself up. Pressing her lips together, she clattered toward the forefront of her balcony. She took a deep breath and projected the sibilant whisper her minions were accustomed to and terrified of. The dark mass below her writhed in abeyance and a juicy group roar indicated her troops’ approval. Once, this sound had made Sheoldred shiver with anticipation, her heart aching with excitement. But now, the bread hadn’t arrived. The commanders had gotten all the nim to stamp their feet, thinking this show of enthusiasm would please her. The courtyard rumbled. Sheoldred grimaced and leaned over the balcony, gripping the railing with her forelegs so tightly she almost broke it to pieces. “Shut up and get in formation!” she shouted, her velvety voice cracking at least three times. Melira looked up with damp tendrils of carmine hair obstructing her vision. Thrun had told her her hair was an asset by human standards and that she should care for it—wash, comb, braid, moisturize, massage, protect it from sun—but she had always only half-listened to his lessons and couldn’t force her fingers to care about braids or combs. So, her fiery locks were always tangly and just hung there, surly and resentful, upon her pale shoulders. Thrun was wringing his hands in his grave, she supposed. But that couldn’t be helped. A commotion near the west entrance to the Furnace Level drew Melira’s attention. 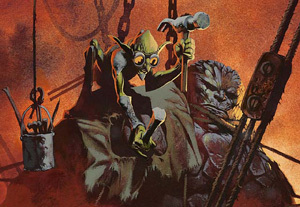 The patchwork gates were sliding open and goblin lackeys were attending the transition. Jor-el’s reconnaissance expedition was back. Melira hurriedly finished her incantation and tucked the blankets up under her patient’s chin. The Sylvok was sleeping soundly and Melira’s magic would make sure the infection spread no further. The young healer stood up and ran her fingers through her hair, doing so so quickly and forcefully that they tangled in the mats and she ended up yanking her own scalp painfully. Biting her lip and feeling unbearably foolish and awkward, Melira disentangled her hands from her treacherous locks and straightened her tunic instead, smoothing the wrinkles. Jor-el looked her direction as he walked through the gate. His off-white cloak swirled around his ankles and even though he appeared bone-weary, he raised his hand in greeting to her. Melira waved in return, not realizing until she became lightheaded again a few seconds later that she’d actually stopped breathing this time. Pinching herself, Melira forced her hands to do something practical, like checking the potions and instruments that lay on the infirmary table nearby. Melira snuck glances toward the west gate as she idly rearranged medical equipment. The goblins were nervous and awkward—this homecoming was strange, indeed. The Auriok recon party had assembled as usual just inside the gates, in neat formation with weapons held respectfully as Jor-el gave instructions. But then, a thing stomped in through the gate and unceremoniously dumped bundles and bundles of razor grass on the furnace floor. Melira’s eyes widened. The thing looked like a walking corpse, with one flaring blue eye. Thrun had told her stories of zombies when she was very young—this was a fae tale come to life! Melira gasped. Following on the heels of the zombie was a dark figure—dark in power and aspect, though radiant in beauty. She was, in fact, the most beautiful woman Melira had ever seen, and the Auriok had seemed like angels when Melira first came to the furnace. The woman’s hair flowed around her shoulders in rivers of ebony. Melira had never seen anything like it. 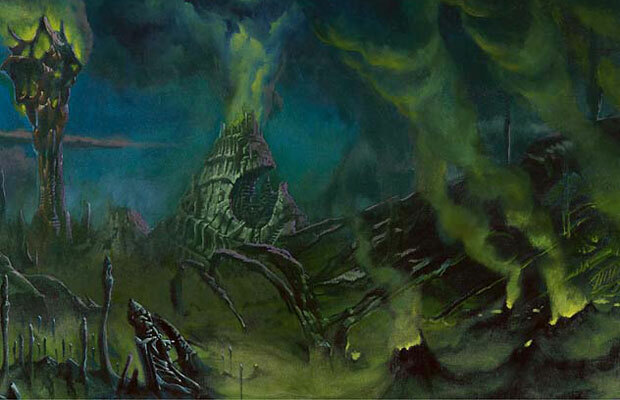 Dark hair was uncommon on Mirrodin, with only a few lucky elves possessing greenish-black tresses. Lithe, but without the musculature of Auriok females, the woman’s skin was fair and seemed to sparkle with violet light at certain angles. She wore indecently tattered clothes that only accentuated her soft, feminine curves. Melira’s heart sank as she realized that it was Jor-el’s spare cloak that hung decadently from the woman’s elegant shoulders. Indeed, the woman wore everything, even her ragged garments, with a regal air that made them seem the finest gown of blinkmoth silk. The woman turned her face toward Melira, full lips curved in a smile of appraisal. Melira gasped—the strange woman’s eyes were dark and the color of amethysts—and to Melira’s horror the woman winked at her before turning back to Jor-el and saying something that caused him to extend his arm in chivalric fashion. The dark lady accepted his gesture and placed her slender fingers around his forearm. Melira felt her face flushing. The healer looked down and fumbled with a roll of bandages. She shivered and didn’t look up again, trying to become as unobtrusive as possible until the recon party had passed out of her sight into the deeper corridors of the furnace living quarters. The great metal man sat in a field. Colorful flying insects surrounded him and their whirring, zzzing music brought him a kind of peace. Where was this field? He did not know. Suddenly a hand crawled up to him. Just a hand, no arm, no elbow, no body attached. Just a hand, and it crawled up and alighted on his knee, scrunched in a way that belied both suspicion and a strong agency. “Who are you?” the golem asked the hand. Venser had never thought of so many ways to induce his own death. Hanging, poison. Asphyxiation (maybe with a pillow, different than hanging), knife wound to the stomach, gangrene, inhalation of poisonous gasses. Decapitation, loss of blood, drowning. Anything, anything would be preferable to what was happening to him now. 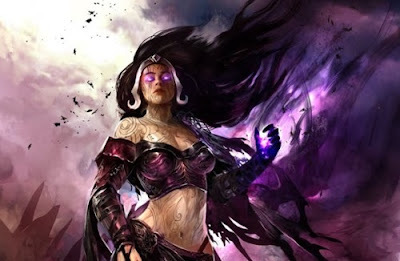 “In my experience, religion is merely a replacement for self-motivation and critical thinking,” Liliana Vess said silkily, dabbing her lips with a coarse napkin and sipping a goblet of deeply red wine. The light of several torches shone on Jor-el’s ivory garments. He didn’t flaunt his figure like most Auriok, Venser had to give him that. But he still gestured, postured, spoke with the same self-righteous confidence and inflections. His mousy brown hair wasn’t coiffed, bleached and straightened, but his movements were narcissistic, and the softness of his hands belied his aversion to real work. 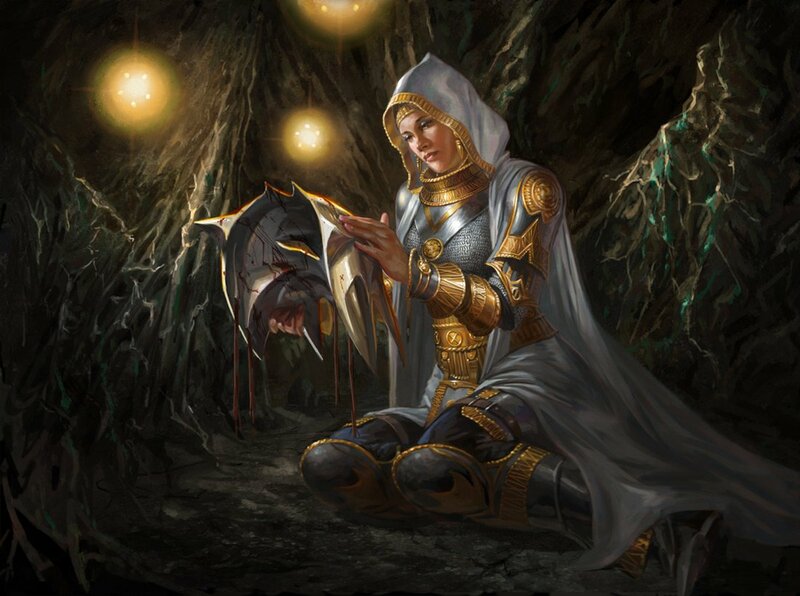 “That may have once been religion’s purpose, but its function has reverted to that of convenient excuse,” Liliana said smoothly, smiling into her goblet. Venser stood, riveted, behind his mistress’s chair. Despite his skepticisim, he felt himself drawn to her, nodding imperceptibly in agreement, and disturbingly, he wanted to sit down beside her, fill her glass. “You have seen much darkness,” Jor-el was saying. “You see much in me,” Liliana returned, and Venser watched her hand creep across the table to rest upon the Auriok shaman’s, resting there with a promise or promises of much, much more. And the zombie artificer retreated to the mazes of his own mind. 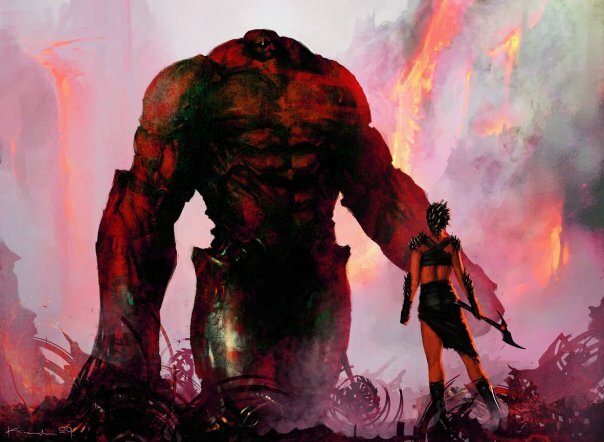 “You give up, huh,” Slobad said from his perch atop the golem’s head. “One has to have a cause, in order to give up on it. I have nothing,” intoned the golem in somber tones. The golem faltered in his stride, realizing something and speaking before he could stop himself. Liliana lay in a soft, unadorned bed of a pewter-like metal. The sheets were deep burgundy—the color of wine—though faded from age and use. The wheels of her mind ever-turning, Liliana realized that fabric like this must be extremely valuable and/or expensive on a world where all was metal. She wriggled down further into the bedding and grinned in the dark. After all her travails, the necromancer had never lost her taste for pure, unadulterated sensual pleasures. She sighed softly as she moved her leg and felt the exquisite cloth flow across her inner thigh. “These are hard to come by,” said a soft voice from the dark, and Liliana started—before realizing it was just Jor-el, edging closer to her and laying his head on her pale shoulder. She frowned, disliking suddenly his uncanny ability to answer her unspoken thoughts. It made her suspicious and tense. And annoyed. “Mmmm?” she demurred, reaching over and stroking his mousy hair, not without feeling some enjoyment herself. Liliana could feel Jor’s smile in the dark. In spite of her misgivings, she smiled back into the shadows. “I like them,” she affirmed. “How much?” Jor’s tone was very un-shaman-like and far from pious, in Liliana’s opinion. “Let me show you,” she said smoothly. The orb that hovered above the springs was base in nature and gave the prisoner within the impression of floating in a dark and endless—yet suffocating---space. The endless dark reflected back the inhabitant’s own worst and most reviled thoughts, feelings, urges. Over and over, on and on, the inner ugliness of the entrapped was splashed upon the walls of the sphere in grand, high-def cinematic fashion. Outside, twin jets of steam burst from the warm waters of the springs. “Yet. Another. Failure. 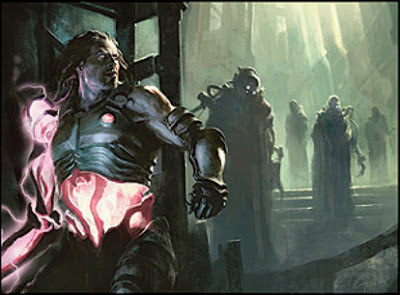 Tezzeret, my little artificer, whatever shall we do with you?” Gigantic nostrils appeared through the surface of the springs, exhaling with contempt. Inside the orb, a fist pounded on the wall and an inarticulate scream sounded, only to reverberate back to the source and cause him to bleed from the ears. The figure within the orb fell to one knee and wept. “Oh, stop being so dramatic,” said Nicol Bolas, as he lifted his head in annoyance from the comforting waters. It was the fifth week of backbreaking manual labor and Venser was fed up. 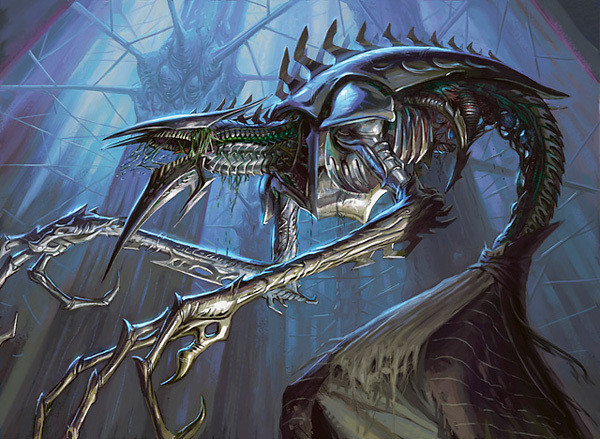 “Thisssss wassssn’t…theplannnn,” he hissed at Liliana one evening, his jaw hanging half-dislocated after a goblin laborer had gotten pissed and backhanded him in the face while they were moving a pile of metal body parts from one furnace to another. “We never had a plan,” Liliana snapped. She was sitting on the salvaged torso of a golem and brushing her hair in a cracked mirror that Jor had brought up from god knows where, especially for her. Venser the zombie stared balefully at his mistress, his one good eye flaring hot like the brightness from the blue sun. Liliana turned slowly toward him, stopping mid-stroke with brush on her river of black hair. Her amethystine eyes burned as intensely as his, but with a deep red at their centers. “Do you have a problem?” she said quietly to Venser, her voice rich and sensual with promises of retribution and violence. The reanimated artificer cocked his head to one side derisively and reached down and scratched himself. What was left of his pants fell off in his hand. Liliana laughed. Venser was very still for a moment. Liliana stared at him mercilessly. Then he bowed his head and turned away. 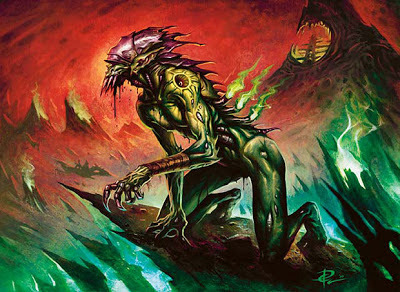 The zombie stumped up the passage into the great room of Mirrodin’s Furnace Level. Yes, he would fetch the Auriok leader for his mistress. And then, he would kill him. And maybe her, too. Somewhere, Elspeth and Koth had to be fighting. They would be carrying the torch of hope. Somewhere, maybe Karn was alive and trying to figure out what the hell was going on, Venser’s heart beating strongly in the golem’s chest. Somewhere, Jhoira must be happy, and somewhere, sacrifices must mean something. Venser reached into his chest cavity and twined his corpse’s fingers around the odd bits and pieces that had been left behind when he teleported his heart into Karn’s corrupted body. With a casual flick of his wrist, Venser ripped out what remained of his most vital organ and dropped it on the rocky ground. He didn’t look back. 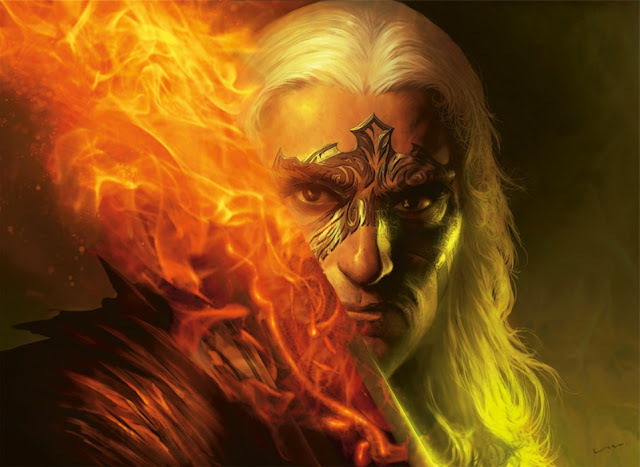 The fires from Jor’s chamber burned with a dull orange glow in front of him. Tromp, tromp tromp…his relentless zombie gait echoed through the Furnace Level with the regularity of a metronome. Venser smiled. Sheoldred sighed. It wasn’t Geth at the Vault of Whispers. It was Jin-Gitaxias. Her entire host had been waylaid by some viscous blue liquid and now she was hanging upside-down in the vault, face to face with one of those infuriating skites. Would the homunculus be coming to her chamber today, with his soft knock? What would he do when she didn’t answer the door this evening? The thought of him turning to go back to the Furnace with his undelivered bread made Sheoldred unspeakably sad. No, she reminded herself—the bread messenger hadn’t been there in weeks. He would not miss her opening the secret door tonight. “Vorinclex. Vorinclex!” Glissa’s voice cut through the paste of his dreams like a hot knife through butter. Butter? Did he know what butter was? How? The Praetor groaned. Vorinclex woke fully at the sound of Glissa’s hesitation, so unlike her. He rose from his bed. “Whoever it is…wants our map to the Core,” Glissa said softly.